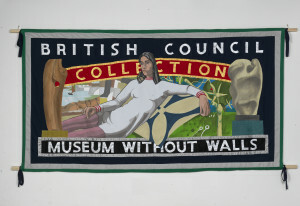 Ed Hall has been known to the British Council ever since his striking campaign and union banners were acquired by the Collection as part of Jeremy Deller and Alan Kane’s Folk Archive back in 2007. Since then, we have shown his eclectic and colourful banners across the world including Paris, Belgrade and Shanghai. It had always been an ambition of the Collection to have a promotional tool that was in keeping with the diverse artistic nature of its subjects and that could be transported and easily shown around the world, and Ed Hall’s banners seemed an exciting way to achieve this. 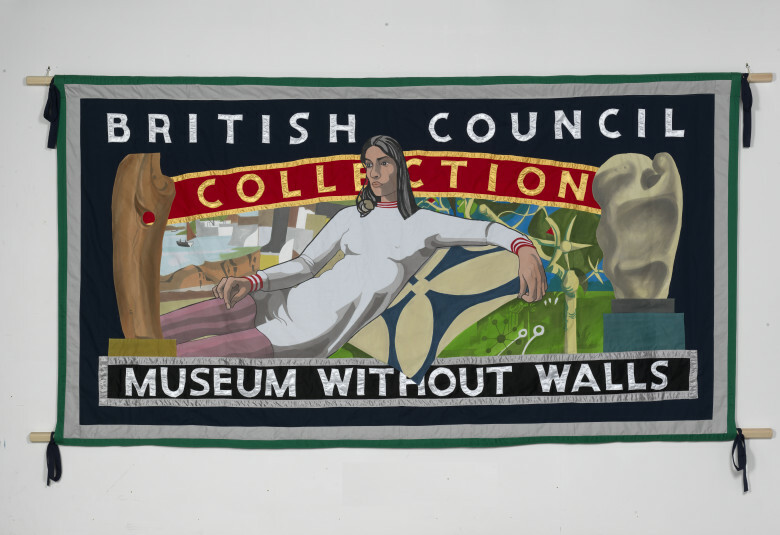 Ed was approached in May 2012 to initially create one banner with a brief to showcase some of the Collection’s most iconic artworks and to display our tag line of Museum without walls. Upon several consultations it was soon realised that one banner just wouldn’t be enough to represent the breadth of artworks in the Collection. The resulting pieces are two majestic banners each measuring 198 by 366 cm. The first depicts some of our older works by Euan Uglow, Henry Moore and Dame Barbara Hepworth with the second banner showcasing the more contemporary side with works by Damien Hirst, Sarah Lucas and even some of our iconic blue packing cases. Ed Hall is a retired architect who has become the foremost trade union and campaign banner artist in the UK. He had his first solo exhibition On the March, in May 2011 at the People’s History Museum and his work can probably be seen in any upcoming demonstration in a UK town! Watch our video to find out more about Ed Hall and his practice.